‘Tis the season of love, and there’s no one we love more than teachers. That’s why, together with our friends at Meemic Insurance, we’re offering this #WeHeartTeachers gift card bonanza, just for educators in Wisconsin, Michigan, and Illinois. 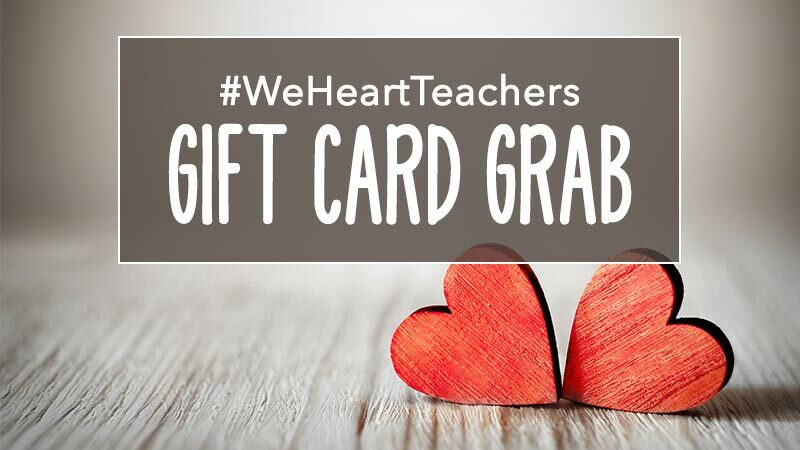 Whether the winners keep the gift cards for themselves or pass them along to their sweethearts, we hope this gift card grab will help educators feel the love. Thanks again for all of your hard work! All entries must be submitted using the online form or be received by mail by 11:59 p.m. Central Time on March 4, 2019. Mail in entries should be sent to WeAreTeachers, Attn: WeHeartTeachers Sweepstakes, 6 Armstrong Road Ste 301 Shelton, CT 06484 and include: your name, complete address, phone number and email address. All entrants must be legal residents of Wisconsin, Michigan, or Illinois with a current U.S. address for prize fulfillment. Prizes that require shipment will not be shipped internationally. Winners will be selected by random drawing and announced on the WeAreTeachers website by March 7, 2019. Prizing: Five lucky teachers will each receive the following gift cards (1) $100 gas gift card, (1) $100 Target gift card, (1) $100 Amazon gift card. (1) $100 Starbucks gift card. (1) $100 iTunes gift card. Total value of prize package is $500. Sponsor, prize providers, promotion agencies and their respective parents, subsidiaries, affiliates, directors, officers, employees, shareholders, representatives and agents (collectively, “Released Parties") will have no liability whatsoever for any injury, losses, harm, damages, costs and/or expenses arising from this Sweepstakes and its administration. By entering, you agree to indemnify, release, discharge and hold harmless Sponsor, its promotion agencies, and their respective affiliated and parent companies, and related entities including officers, directors, employees, licensees and assignees of each, from all claims or damages arising out of your participation in this promotion and/or acceptance, ownership or use of any prize.